In my post Adding Resolve to your Resolution I referenced Charles Duhigg’s book The Power of Habit. Charles has published a blog post today: Got a New Year’s Resolution? Here’s how to make it stick! which includes the following flowchart to help habits become ingrained. 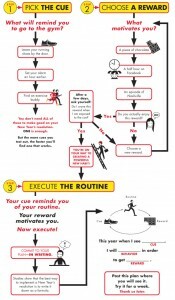 Habits – Cue, Routine, Reward Flowchart. This entry was posted in Self Improvement on 2014-01-2 by liamvictor. At this time of year we reflect on what has come to be and think of the possibilities of a new start in the New Year. It’s now traditional to plan, making resolutions to fix what is broken and think on of what you want. But anyone who has been taught manners knows that “I want doesn’t get”. And if planing of fixing the broken worked why haven’t you achieved last year’s resolutions and goals? This year don’t *want* to change something broken. Just keep doing what’s already working. Do more of what is right for you. Do you enjoy the walk in the sunshine to work from the bus stop? Make a resolution to do get up 15 minutes earlier in the summer and get off a stop earlier. Do you enjoy the smell of fresh cinnamon buns in the morning when you’ve remembered to set the bread machine the night before? It worked. Do it again. Did getting up at five to look after your six your old daughter when she was sick that time, and then you spent an hour writing your novel when she went back to sleep and the house was quiet make you feel energised & vital rather than exhausted? It worked. Do it again; set the alarm an hour earlier than the rest of the house wake up and do it. Again and again. Don’t look to add something new. Nor indeed to remove something broken. Find something that you’ve done, worked and do more of it. This entry was posted in Self Improvement on 2014-01-1 by liamvictor.